This contemporary headboard is sure to add that wow factor to any bedroom. It’s size varies in height depending on the headboard size chosen. The size of each square also varies in size depending on the headboard size. This headboard is 100% Irish made. 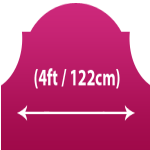 Headboard Sizes are as follows 3 foot: – Height of 36” plus the addition of a 7” mattress panel. This will have 3 squares across and 3 squares down (each square is 12” x 12” approx). 4 Foot: – Height of 36” plus the addition of a 7” mattress panel. This will have 4 squares across and 3 squares down (each square is 12” x 12” approx). 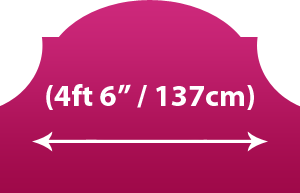 4 Foot 6”: – Height of 40.5” plus the addition of a 7” mattress panel. This will have 4 squares across and 3 squares down (each square is 13.5” x 13.5” approx). 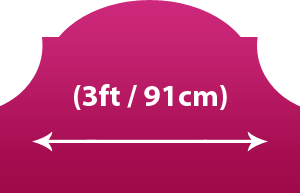 5 foot headboard: – Height of 36” plus the addition of a 7” mattress panel. This will have 5 squares across and 3 squares down (each square is 12” x 12” approx). 6 foot headboard: – Height of 43.5” plus the addition of a 7” mattress panel. This will have 5 squares across and 3 squares down (each is square is 14.5 x 14.5 approx). All the headboard sizes above will have an additional 7” mattress panel.